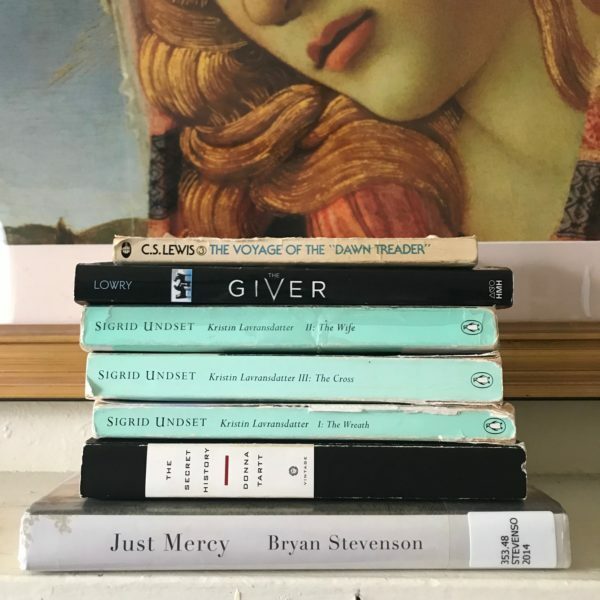 Since I love chatting about books, I’ve been trying to share our family’s current reads on a regular basis here on the blog. And some fabulous new books have come out lately (including a few that I’m giving away to a lucky reader!) so I wanted to share the love! I borrowed this one from the library after it was recommended by my dad. It really is a must-read. I knew our justice system was horrifying but this book laid it all out in a way that deeply impacted me. Stevenson is a brilliant storyteller and manages to use powerful narrative to shed light on the institutional racism and discrimination against the poor in this country. Christy tells me I’m the last person in the universe to read it (I don’t read that many recently released books, I like old books), but if you haven’t read it yet, please do. I’m about 160 pages into this mystery that my dear friend Boze gave me for Christmas. It is a treat. Lots of the Oxford years from Brideshead vibes. Tartt is Catholic so this is going to be my “Book by a Catholic Novelist” category pick, but I guess it could also work for “Book by a Catholic Woman”! We’re about to wrap up the 3rd book in the Chronicles of Narnia as our bedtime read! After the girls fall asleep, Benjamin and I usually spend a little extra time reading together and we just started this classic! I’ve known of Sally’s lovely work for years. Then I got to know her daughter Joy on Twitter. THEN we got to interview her other daughter, Sarah, for the podcast. 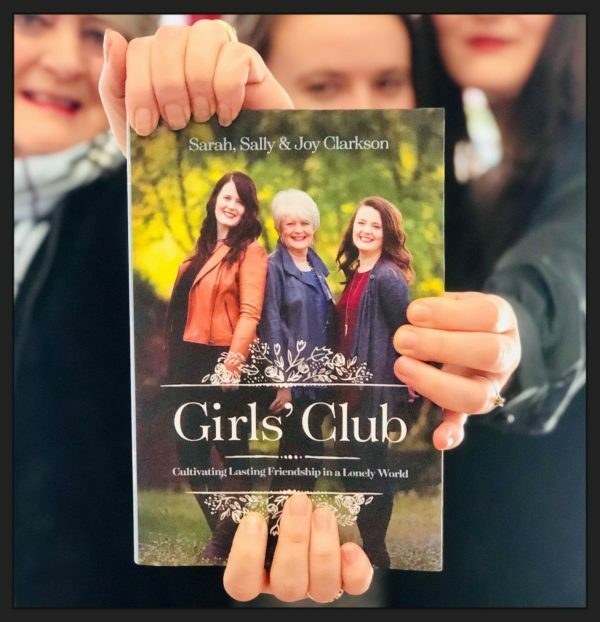 They are all absolute treasures and their book Girls’ Club, a collaborative effort by the Clarkson women releases TODAY! It’s a beautiful book about cultivating friendship and the beauty and strength of women supporting, encouraging, and challenging each other. I have two copies to give away, just follow the instructions below. (To enter the giveaway to win a copy of Girls’ Club and a copy of my book as an audiobook–there will be two winners–head over to my Instagram account: @haleycarrots). 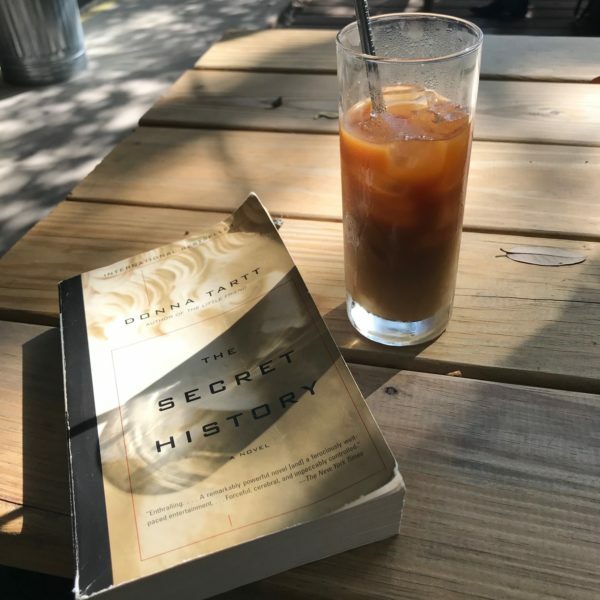 What are you reading and enjoying lately? Let me know in the comments! P.S. I’ve been doing a lot more podcasting and freelance work lately and I rarely have a chance to direct Carrots readers over to these episodes or articles via blog post. 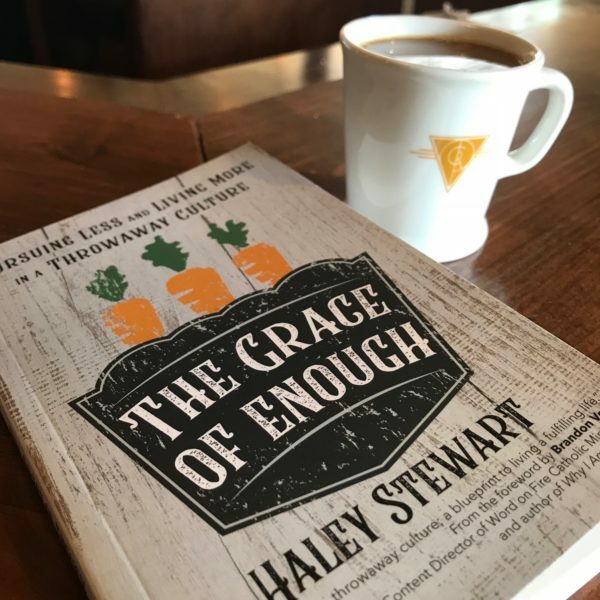 If you want to stay current on my writing and podcast blabbing (as well as general Carrots news/family updates, etc), make sure you’re signed up to receive my weekly email newsletter. It’s free, of course, and lots of fun! Adding Just Mercy to my TBR list! I just finished The Giver. I’d never read it and knew nothing about it— to be honest, parts of it were horrifying to me! I’m going to shelf it with others like Huxley and Orwell for when my kids are a bit older (my oldest is 11) because it would foster good conversation eventually. I think maybe I’m just not a fan of dystopian books, plus pregnancy hormones= not my fav! But I’ll be interested to read what you and your son think! (I’d recommended pre-reading Ch 5 on “stirrings” before reading with him in case it’s not a subject you want to broach yet— re: desiring a girl). Have you read The Hawk and the Dove series? I have been reading through the Harry Potter series for the VERY FIRST TIME! (in large part due to your influence—been a longtime follower of your blog now) I’ve lost count of how many people who have told me they’re jealous I get to experience it all for the first time. 🙂 I got through the first three books in January and am currently reading Goblet of Fire. I LOVE LOVE LOVE Kristen Lavransdatter. Seriously, it is amazing. I read it years ago and I still think about it often. Right now, I ‘m reading some high concept sci fi–The Fractal Prince–and The Story of My Life by Helen Keller. Am just starting Kristin Lavransdatter (also reading it my LONG read) and about to finish “Crossing to Safety” based on Christy’s recommendation. I finally got Marilla of Green Gables to read—I’d been on the library’s waiting list for months. It was beautiful and tragic. Agh. I’ve read Whiskey in a Tea Cup, An American Marriage, A Man Called Ove, Jesus Among Other Gods, and Cold Sassy Tree…a bit of everything! I’d love to read that article comparing Kristin with Julia! I have too many books going, but one is in your Cathlit categories – Mary, Queen of Scots. I’d love to read your article comparing Kristin with Julia! I have too many books going, but one is from the cathlit categories – Mary, Queen of Scots. Winter Wheat, by Mildred Walker. It’s the fictional life of a young woman on a Montana ranch at the beginning of WWII. Coming of age, rural existence, family burdens…..it is a haunting read, and reads like reality. There you have it. Kristin Lavransdatter has been coming up a lot for me lately, so I am definitely adding it to my list! I just re-read all of the Narnia books last year, which was delightful, and Voyage of the Dawn Treader is still definitely my favorite. I love the epic, Odyssey-style narrative of that one and it also has my favorite group of characters. I have been on a HUGE G.K. Chesterton kick for the last few months. I’ve done Orthodoxy and The Everlasting Man already, but now I’m getting into his fiction with Father Brown, The Napoleon of Notting Hill, and I’m currently reading The Man Who Was Thursday. I’m looking forward to reading your Kristin/Julia article. Two of my favorite literary women! In January, I finished “The Betrothed” (I Promessi Sposi) by Alessandro Manzoni, aka the “Great Italian Novel.” I’m currently re-reading “A Severe Mercy” by Sheldon Vanauken for the third time and will soon be finishing Austen’s “Emma.” The book club I’m a member of just started Karol Wojtyla’s “The Jeweler’s Shop” this week. You are not the last person to read Just Mercy, I just might be. I picked it up last year at my library but wasn’t in the right mood. You have inspired me to pick it up again. I am about 100 pages in and I have already teared up several times. I’ve had Just Mercy on my tbr pile for bout a year, ever since one of my tutoring students read it for a class. I’ll read it soon so you don’t have to be the last person to read it. Thanks so much for your book suggestions! I struggle to find books that have a good catholic foundation. I really appreciate your work on the blog. I always enjoy your posts. Congrats on your new baby! I was wondering how you decide which books to own and which to just borrow from the library?